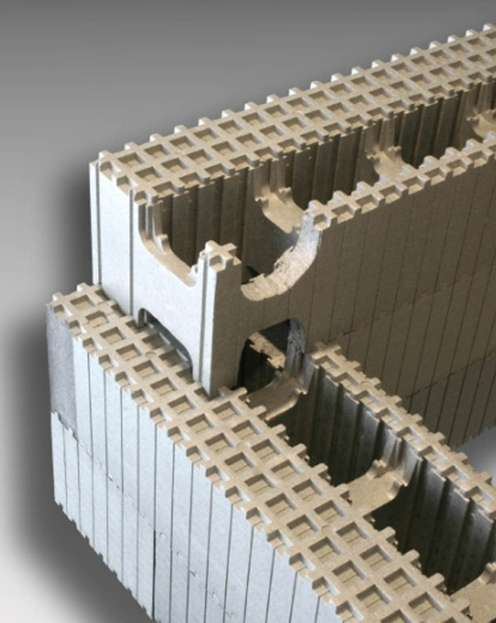 The Izodom technology allows a few methods of making formwork corners. 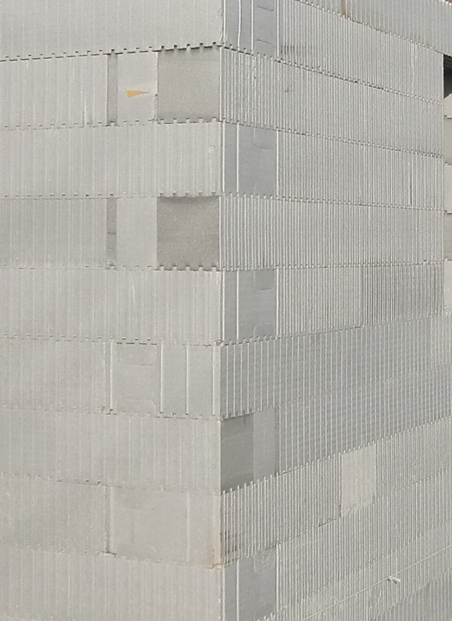 The elements can be joined just like a course of bricks or blocks and an opening should be cut in the wall of one of the adjoining elements to allow the monolithic connection of concrete in the corner. 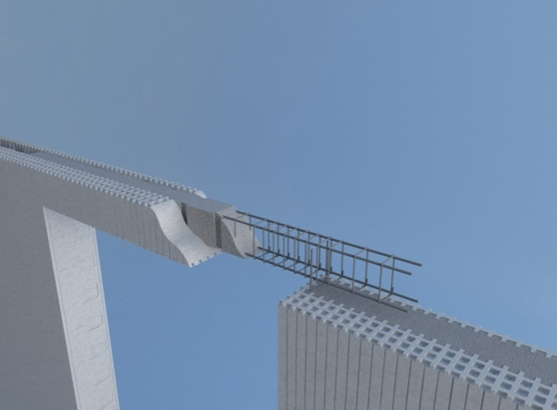 Without the opening, the concrete in two perpendicular walls would not "meet". 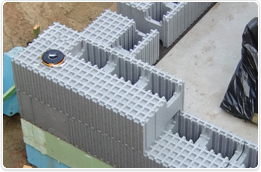 This method of joining the elements in successive courses makes the formwork more rigid and prevents weakening of the insulation layer. It is also possible to use the Izodom corner elements. Our product range includes many such elements with the 45° or 135° angle used for fast erection of oriels. 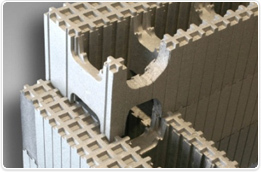 Elements, such as MCFU 35 E 45°, are in the LH/RH and inner/outer versions. 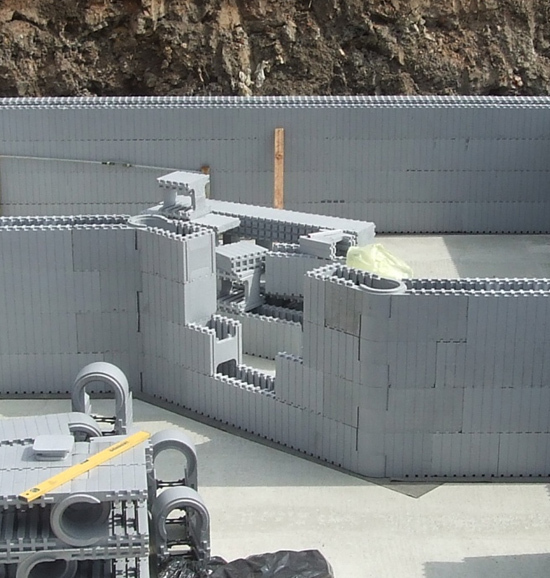 These four elements can be easily connected with the wall elements and can be used to make the wall turns, now often used by the architects. 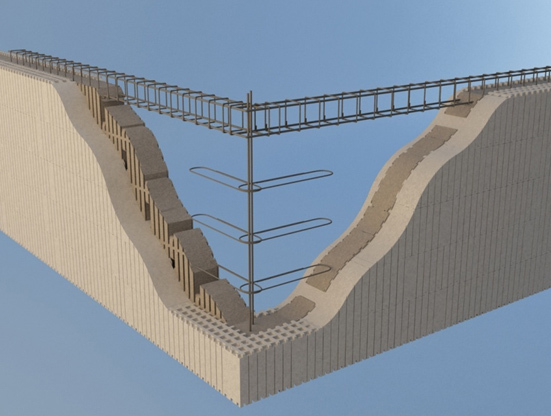 Round walls or walls turning at a different angle can be made in rather uncomplicated manner with the MCF 0.7 “hinge” elements which allow to replicate any wall turning angle. The figure below shows the wall with two turns, with an element installed in the bottom course. Such stiffening used before concreting ensures that the planes of both parts of the wall will fit perfectly and there will be no problems to install the doors afterwards. 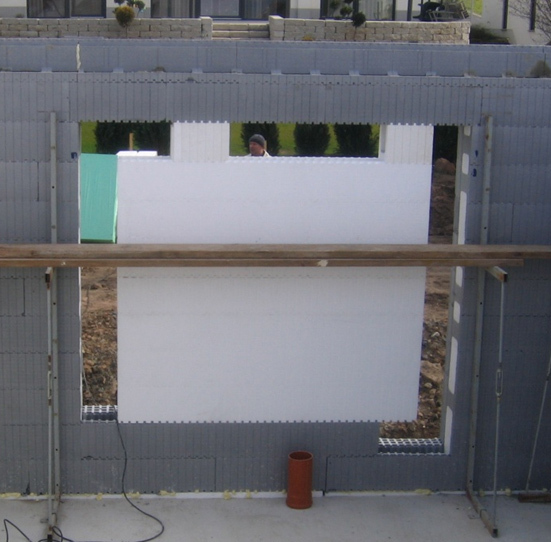 The Izodom technology does not require a lot of reinforcement because a 15 or 20 cm concrete wall is very strong itself. 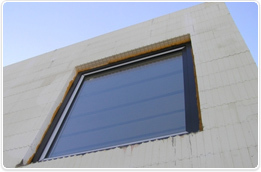 However, the corners and edges are critical areas and need an additional strengthening. 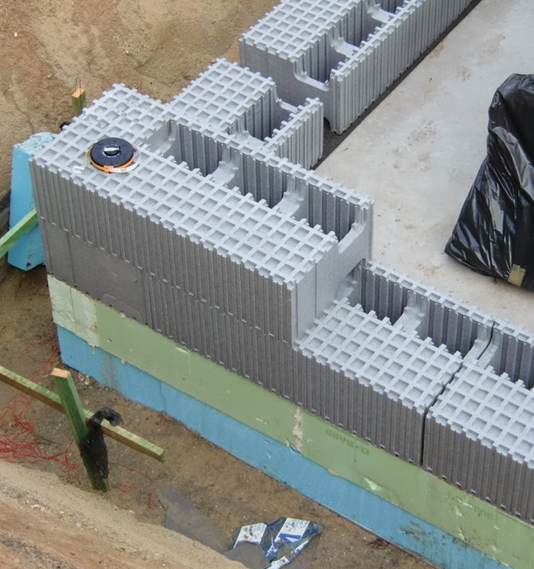 In the corners, we use vertical reinforcement with two 10 mm dia rebars to strengthen the joint between walls. 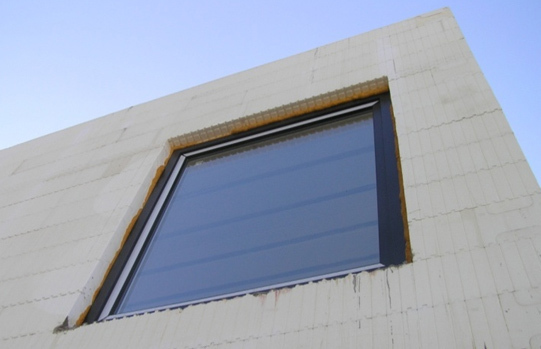 It is particularly important in case of connection between the gable and the side wall in buildings with pitched roofs. Special oval stirrups made of 5 or 6 mm dia wire are placed in each course of the styrofoam elements (see figure below). 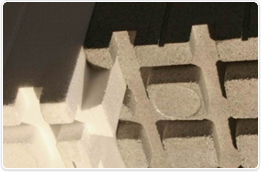 The lintels are made from the U-shaped ML elements. 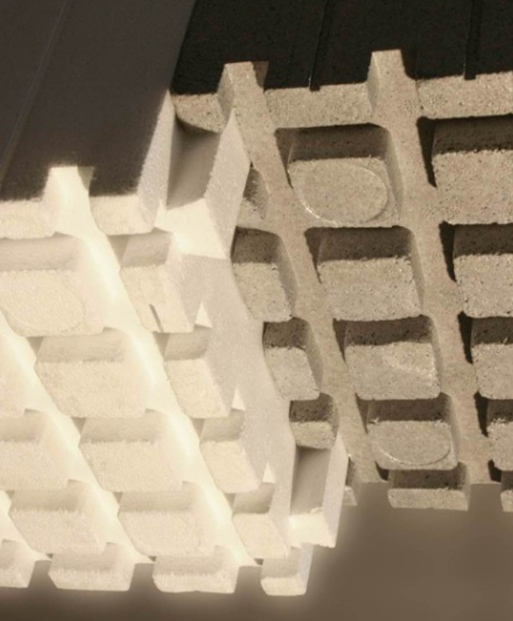 One-metre elements are joined by means of the tongue-and-groove method to obtain the required lintel length. Then, the reinforcement as specified by the designer is placed in the formwork, the lintel is supported and the concrete is poured. 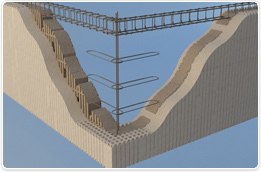 The lintel formwork can be propped by putting a plank underneath and a few shores. 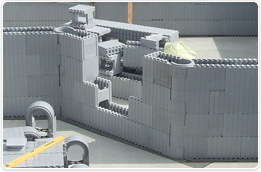 We can also use the Izodom elements which will act as a support when pouring concrete. 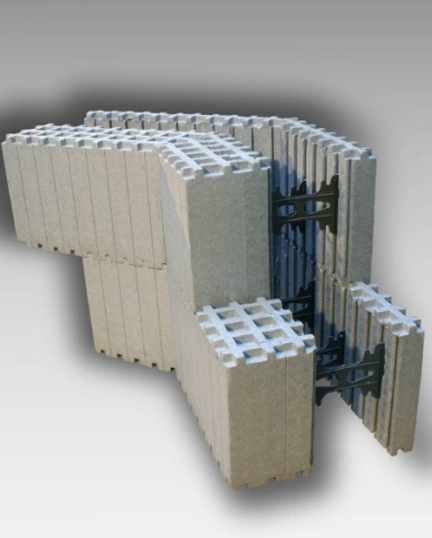 This eliminates using timber and ensures that the walls on both sides of the opening are exactly in the same plane. 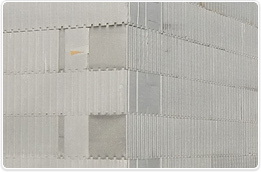 After concreting, we get a strong reinforced concrete lintel monolithically joined with the load-bearing walls on which it rests. 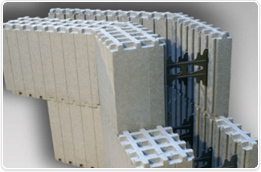 Use of the insulating formwork elements effectively prevents formation of thermal bridges. 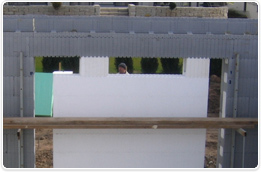 Example of using the elements to shore the lintel for concreting. Quick, clean and no timber needed. Effect after concreting - a perfectly continuous insulation layer.